Christopher Clavius, born Christoph Clau, (25 March 1538 - 12 February 1612 (Gregorian calendar dates)) was a German mathematician and astronomer who was the main architect of the modern Gregorian calendar. In his last years he was probably the most respected astronomer in Europe. E. Millosevich discovered asteroid #303 Josephina. L. Carnera discovered asteroid #481 Emita. S. Belyavskij discovered asteroids #1084 Tamariwa and #1094 Siberia. P. Bourgeois discovered asteroid #1547 Nele. E. Delporte discovered asteroid #2101 Adonis. L. Boyer discovered asteroids #1413 Roucarie and #1414 Jerome. Y. Vaisala discovered asteroid #1541 Estonia. L. Oterma discovered asteroids #1680 Per Brahe and #2846 Ylppo. A daytime fireball and meteorite fall was seen in the Sikhote-Alin Mountains, in southeastern Russia. The Central Committee of the Communist Party of the Soviet Union together with the USSR Council of Ministers for missile test and space technology research passed a joint resolution deciding to build a space center in Baikonur ("Rich Valley"), Kazakhstan. The General Electric Company announced that it had made Borazon, a material hard enough to scratch diamonds. USSR launched Venera 1, the first spacecraft to fly by Venus. Venera 1 was launched 12 February 1961, and was the first spacecraft to fly by Venus. The probe consisted of a cylindrical body topped by a dome, totaling 2 meters in height. Two solar panels extended radially from the cylinder. The probe was equipped with scientific instruments including a magnetometer attached to the end of a 2 meter boom, ion traps, micrometeorite detectors, and cosmic radiation counters. The dome contained a pressurized sphere which carried a Soviet pennant and was designed to float on the putative Venus oceans after the intended Venus impact. Venera 1 had no on-board propulsion systems, and temperature control was achieved with thermal shutters. Venera 1 was launched along with an Earth orbiting launch platform (Tyazheliy Sputnik 5 (61-003C)). From the 229 x 282 km Earth orbit, Venera 1 was launched toward Venus. On 19 February, 7 days after launch and at a distance of about two million km from Earth, contact with the spacecraft was lost. On 20 May 1961, Venera 1 passed within 100,000 km of Venus and entered a heliocentric orbit. Died, John Hays Hammond, Jr., known as "the father of radio control"
USSR's Mars 5 probe arrived at Mars and went into orbit around the planet where it collected data for 22 orbits until a loss of pressurization in its transmitter housing ended the mission. Mars 4, 5, 6, and 7 comprised an associated group of Soviet spacecraft launched towards Mars in July and August of 1973. Mars 5, launched 25 July 1973, was designed to orbit Mars and return information on the composition, structure, and properties of the Martian atmosphere and surface. The spacecraft was also designed to act as a communications link for the Mars 6 and 7 landers. The orbiter only operated a few days, and returned atmospheric data and images of a small portion of the Martian southern hemisphere. Mars 5 was launched into Earth orbit by a Proton SL-12/D-1-e booster, and propelled from its orbital platform into a Mars transfer trajectory at 20:15 UT on 25 July 1973. Its fully fueled launch mass was 3440 kg. After a mid-course correction burn on 3 August, the spacecraft reached Mars on 12 February 1974 at 15:45 UT and was inserted into an elliptical 1755 km x 32,555 km, 24 hr, 53 min. orbit with an inclination of 35.3 degrees. Mars 5 collected data for 22 orbits until a loss of pressurization in the transmitter housing ended the mission. About 60 images were returned over a nine day period showing swaths of the area south of Valles Marineris, from 5 N, 330 W to 20 S, 130 W. Measurements by other instruments were made near periapsis along 7 adjacent arcs in this same region. Mars 5 was equipped with a television imaging system comprised of two cameras. One, called Vega, was f/2.8 with a focal length of 52 mm, a 23 x 22.5 mm frame, and a 35.7 degree look angle. The other camera, Zufar, was f/4.5 with a 350 mm focal length, 23 x 22.5 mm frame, and a 5.67 degree look angle. Images were taken through blue, red, and green filters in addition to a special orange filter, and could be facsimile scanned at 1000 x 1000 or 2000 x 2000 pixels and transmitted to Earth. The cameras provided pictures with resolutions of 100 m to 1 km. In addition, there was a single-line scanning device with a 30 degree field of view to provide panoramic images in the visible and near-infrared. The spacecraft was also equipped with a Lyman-Alpha photometer to search for hydrogen in the upper atmosphere, a magnetometer, plasma ion traps and a narrow angle electrostatic plasma sensor to study the solar wind, an infrared radiometer (8-40 microns) to measure surface temperature, a radio telescope polarimeter (3.5 cm) to probe the subsurface dielectric constant, two polarimeters (0.32-0.70 microns) to characterize surface texture, and a spectrometer (0.3 - 0.8 microns) to study emissions in the upper atmosphere. There were four photometers on board: one for 2 carbon dioxide bands to obtain altitude profiles, one at 0.35 - 0.7 microns for albedo and color studies, one in the water vapor band (1.38 microns) to study water in the atmosphere, and a UV photometer (0.26 and 0.28 microns) to measure ozone. The probe was equipped with a radio-occultation experiment to profile atmospheric density and a dual-frequency radio occultation experiment to profile ionospheric density. The spacecraft also carried French experiments, one called Zhemo to study the distribution and intensity of fluxes of solar protons and electrons, and one known as Stereo-2 to study solar radio emissions. Data returned from orbit by the Mars 5 infrared radiometer showed a maximum surface temperature of 272 K (-1 C), 230 K near the terminator and 200 K at night. Thermal inertia of the soil was consistent with grain sizes of 0.1 to 0.5 mm, polarization data showed grain sizes smaller than 0.04 mm in aeolian deposits. Six altitude profiles were measured by the CO2 photometer. U, Th, and K composition similar to terrestrial mafic rocks were found. A dielectric constant from 2.5 to 4 was measured at depths of several tens of cm. A high water vapor content (100 precipitable microns) was found south of Tharsis region. An ozone layer was detected at 40 km altitude with about one-thousandth the concentration of Earth's. The exosphere temperature was measured at 295-355 K, 10 K lower temperatures were found from 200 to 87 km. A small magnetic field was postulated, about .0003 Earth's. Mars 5 also performed a radio occultation experiment and the results, in concert with results from Mars 4 and 6 occultation measurements, showed the existence of a nightside ionosphere with a maximum electron density of 4600 per cubic cm at an altitude of 110 km and a near surface atmospheric pressure of 6.7 mbar. 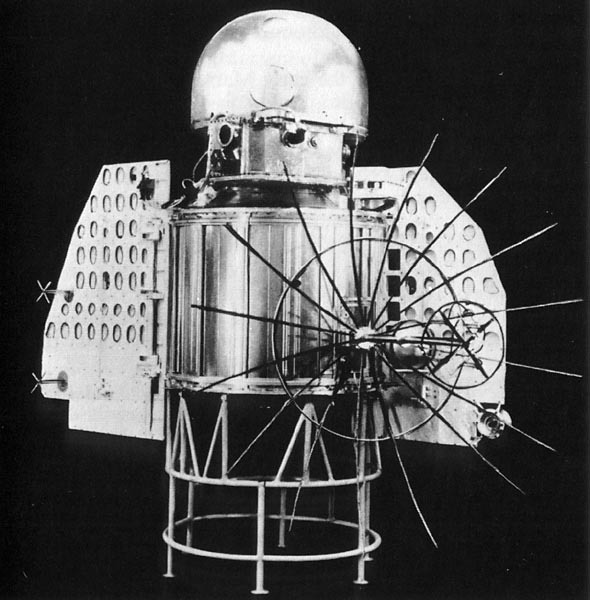 Cosmos 1076 was launched, the first prototype of a Soviet oceanographic satellite. NASA's NEAR Shoemaker touched down on the asteroid Eros and continued transmitting, becoming the first landing on an asteroid.